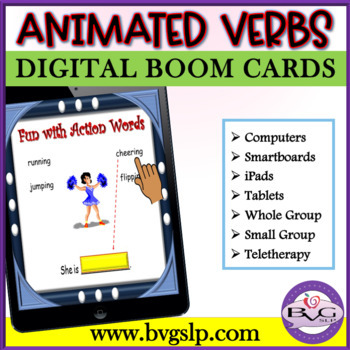 BOOM CARDS Speech Therapy Boom Cards for Formulating Sentences: This is a comprehensive NO PREP, NO PRINT Boom Card Activity that addresses Verbs, Vocabulary, and Forming Simple to Complex Sentences. It includes full-color, high-resolution images that are ANIMATED and is fully interactive with point and click and DRAG and DROP features offering immediate feedback. These cards are self-grading and are a fun engaging way to address receptive and expressive language, vocabulary, verbs, formulating sentences, and MORE! 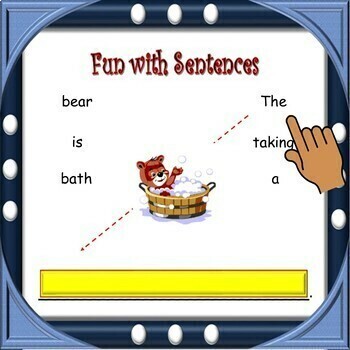 It includes a wide variety of ANIMATED pictures for multiple opportunities for students to demonstrate their understanding of formulating simple to more complex 3-6 word grammatically correct sentences. 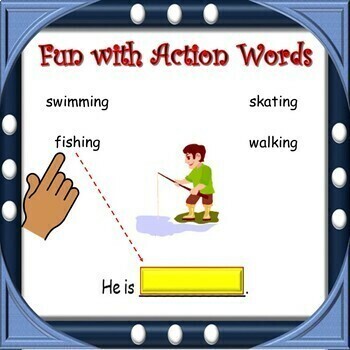 This lesson can be played on Smartboards for whole group instruction, computers, tablets/iPads for small group and 1:1 individual learning, and speech teletherapy, telepractice (via Site/Screen Share) platforms for interactive remote sessions. It is full color and intended for digital use. With your Teachers Pay Teachers purchase, users new to Boom Learning get a three-month free trial of student progress reporting for up to 150 students. Your trial includes the ability to make up to 5 free DIY decks. You may upgrade or cancel at any time. Boom Cards play on modern browsers (released in the last three years) on interactive whiteboards, computers and tablets. Boom Cards apps are also available. Not sure if your browser is modern enough? Try a free Boom Cards deck first. When you redeem your purchase, Boom Learning opens an account for you if you do not already have one. If you do not subscribe at the end of your trial, you will be able to continue using Boom Cards with the Fast Play feature. Fast Play does not track individual progress. If you do not subscribe we will delete your student records 3 months after the expiration of the trial to protect student privacy. To learn more about how Boom Cards work please click HERE to read my blog post. 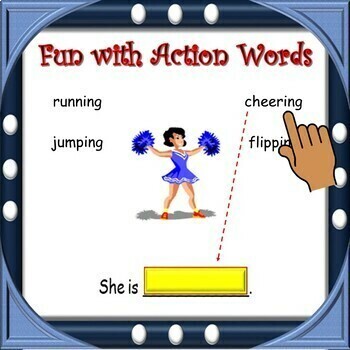 If you like this unit, please take a look at my "Boom Cards: Answering Yes/No Questions", "Boom Cards: Shapes and Colors Galore", "Boom Cards: Category Sorting Fun", "Google Digital Interactive Notebook:All About Me, "Google Digital Interactive Notebook Objects and Functions", "Google Interactive Following Directions", "Spring into Language", "Multiple Meaning Words", "Animated Vocabulary", "Same or Different", "More or Less", "Rhyme Time", and "Can You Describe That" lessons which are great accompaniments to continue teaching important foundation skills.